When does the Netherfield scheme start? The Selective Licensing in Netherfield starts on 1st October 2018 and runs until 30th September 2023. From that date you are liable to civil penalties and rent repayment orders from your tenants. In Netherfield the landlord licence normally lasts for 5 years which is the duration of the designation. However if you fall short of the requirements the council can issue licenses for much shorter periods. What is the cost of a licence in Netherfield? The licence in Netherfield costs £640 per property. However if you are acredited then the cost is reduced to £490. When you apply you must pay £475 then when the licence is issued a further £165. If you complete the paper form there is an additional charge. How do I apply for a licence in Netherfield? The licence applications are online and the portal opened on 21st September 2018. You will be required to register for a licence and upload your documents to the Gedling Borough Council website. However there is an option to complete a paper application. NGalloway are landlords and we help with applications. We are running sessions Monday to Saturday from 17th September 2018. All sessions are strictly by appointment. You can register here or call us on 0115 6972829. What is the point of Selective Licensing? Most of the conditions of the scheme are already law and should be done anyway. However the landlord licensing is about registering the landlords and council having the authority to check that each landlord is doing what he should be doing. Most of the conditions of the scheme are already law and should already be in place. Unfortunately, even the ‘good landlords’ are all too often non compliant with those requirements. We have specific cases on our books, where landlords have been non compliant whilst being previously managed by Letting Agents. Whilst Selective Licensing is a bitter pill for us all to swallow, there is clear evidence that it is required. Selective Licencing is about registering the landlords and the Council having the authority to check that each landlord is doing what they should be doing and if they are not compliant taking the appropriate action. Further more, if you are non compliant you have very little recourse in court to address anti social behaviour and collect rent arrears. We want to protect you from this. Condition 4. The licence holder shall ensure a record of visual inspection of such appliances is maintained and shall submit this record to the council within 7 days of the council’s demand. Condition 13. The licence holder must ensure that gardens, yards and other external areas are cleared of rubbish, debris and accumulations and are cleared between tenancies. All refuse and unwanted items are cleared from the house and disposed of in an appropriate manner before new tenants move in. Condition 15 (f). The licence holder shall ensure so far as is reasonably possible, that the occupiers make arrangements for the collection of waste in accordance with these provisions and, when the property is unoccupied, adhere to these provisions him/herself. Condition 17. The licence holder shall ensure that inspections of the property are carried out at least every six months to identify any problems relating to the condition and management of the property. The records of such inspections shall be kept for the duration of this licence. As a minimum requirement, the record must contain a log who carried out the inspection, date and time of inspection and issues for an action(s) taken. Copies of these must be provided within 7 days of the council’s demand. Condition 18 At the beginning of a new tenancy, the licence holder must provide the occupier(s) with written information, including contact details, explaining how they can make a complaint about the property and the arrangements in place to deal with emergency and other repairs. The contact and telephone number details should be applicable for contact between 9am – 5pm Monday to Friday and should also include out of hours contact details for use in emergencies. Any change in contact and/or telephone number details should be provided to occupiers within 24 hours of the changes being made. Copies of the written information provided to tenants must be provided within 7 days of the council’s demand. Condition 19 The licence holder shall indicate to the occupier(s) how they intend to respond to the complaint including a timescale for the steps they intend to take. Condition 20 The licence holder shall respond to any complaint within a reasonable timescale. Copies of all correspondence relating to complaints shall be retained during the currency of the occupation and for 6 months thereafter and shall be provided to the council within 7 days of the council’s demand. Condition 23 The licence holder shall comply with all relevant landlord and tenant law and shall ensure that all legal processes are followed when requiring occupiers to leave. If a complaint of illegal eviction is made to the council, the licence holder shall provide information as to the steps taken to evict an occupant within 7 days of the council’s demand. Condition 26 (a) Any letters, relating to anti-social behaviour, sent or received by the licence holder, or agent of the licence holder, must be kept by the licence holder. True copies of the original document should be provided to the Council within 7 days on demand. Condition 26 (b) Ensure that written notes are kept of any meetings or telephone conversations or investigations regarding anti-social behaviour. Condition 26 (c) If a complaint is received, or anti-social behaviour is discovered, within 7 days the tenant must be informed of the allegations of anti-social behaviour in writing and of the consequence of its continuation. Condition 26 (d) From the date of receipt of the complaint of anti-social behaviour, monitor any allegations of anti-social behaviour and take all necessary steps to establish if it is continuing. Condition 26 (e) Where the anti-social behaviour is continuing after 14 days from receipt of the complaint, the licence holder, or his agent must, within 7 days visit the premises and give to the tenant, or leave at the property marked for their attention, a warning letter advising them of the possibility of eviction. Condition 26 (f) Where the licence holder or his agent has reason to believe that the anti- social behaviour involves criminal activity the licence holder must ensure that the appropriate authorities (e.g. Police, Council etc.) are informed. Condition 26 (g) If after 14 days of giving a warning letter the tenant has failed adequately to address the anti-social behaviour so that it is continuing, the licence holder must take appropriate formal steps under the tenancy agreement, whether to enforce its terms or to terminate it, including, where necessary, by taking legal proceedings against the occupier(s). Condition 26 (h) Where the obligation under (g) has arisen, the licence holder must, within 7 days, provide to the Council in writing a plan setting out the steps he proposes to take, and the timescale for taking those steps, in order to resolve the problem. There may be instances where anti-social behaviour occurs more than once, but not continuously and possibly several months apart. In such circumstances the licence holder would still be expected to take all reasonable and practical steps to ensure it is effectively dealt with, up to and including eviction. Condition 27 (c) Any changes to their, the manager’s or any associate’s circumstances which could affect their fit and proper person status i.e. any cautions or convictions for any offence involving fraud, dishonesty, violence, drugs, sexual offences (under Sexual Offences Act, schedule 3) discrimination or breach of housing or landlord/tenant law. Condition 27 (d) Any proposed changes to the layout of the house that would affect the licence or licence conditions. Condition 28 (a) By attending training course or undertaking online training arranged and delivered by our accreditation partner DASH Services and submitting a certificate to the Council following this training. Visit dashservices.org.uk or call 01332 641111 to arrange this. Condition 28 (b) By completion of the accreditation training of the National Landlords Association (NLA) or Residential Landlords Association (RLA) or other equivalent recognised landlord accreditation body and submitting the pass certificates to the Council for confirmation. Condition 28 (c) By completion of other suitable training on the law and legal requirements relating to managing privately rented properties as provided by East Midlands Property Owners Ltd (EMPO) or other recognised landlord training subject to approval by the Council in advance and subject to submitting a pass certificate or similar document to the Council for confirmation. Condition 29 Where reports, certificates, declarations or other documents are required to be produced or supplied to the Council, this shall mean sending by email (preferred method), post or delivering by hand, declaration to the Council’s offices for the attention of the Public Protection Service. Condition 30 Any reference to tenant or tenancy can also be interpreted to include occupancy by licence or other form of written agreement for the purposes of these conditions. In Netherfield there are around 650 private rented properties that will need a landlord licence by 1st October 2018. The ward area has about 3,000 houses, a town center and an adjoining railway station. Applications are online but you can complete a paper application form at an additional cost. These are 30 Selective Licence Conditions that set out your obligations. These have been put in place to regulate the private rental sector in Netherfield. 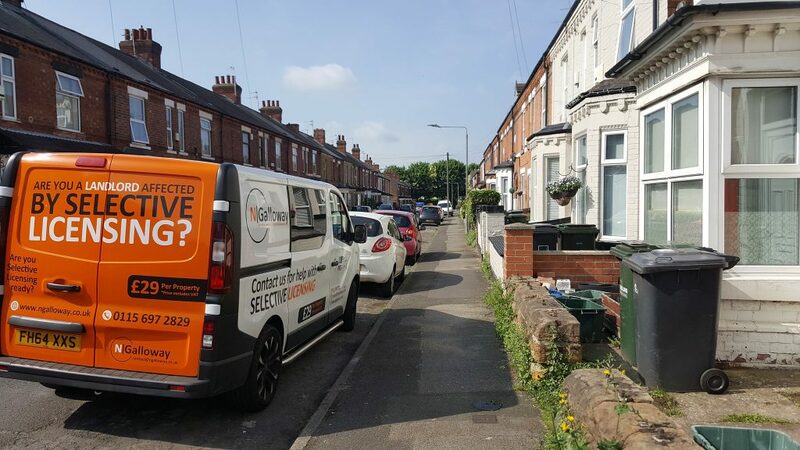 The conditions require landlords to achieve certain standards of management and maintenance, helping to bring about better quality housing in Netherfield. There are severe penalties for non-compliance of the Selective Licence Conditions. The loss of your Selective Licence, or special conditions imposed. Fines up to £30,000 per offence instead of prosecution. Prosecution and a prison sentence and or an unlimited fine and a criminal record. Registered on the National Data-base of Rogue Landlord. The council also have the power to levy fines that become attached to the land registry on your property so non-payment would put your properties at risk of repossession. Let us take the hassle and worry away. Let us manage your property. We have designed our standard terms of service to take account of the Selective Licensing Conditions so that you don’t have to worry. The licence holder shall ensure a record of visual inspection of such appliances is maintained and shall submit this record to the council within 7 days of the council’s demand. The licence holder shall ensure so far as is reasonably possible, that the occupiers make arrangements for the collection of waste in accordance with these provisions and, when the property is unoccupied, adhere to these provisions him/herself. these must be provided within 7 days of the council’s demand. 22. At the beginning of a new tenancy, the licence holder must provide the occupier(s) with written information, including contact details, explaining how they can make a complaint about the property and the arrangements in place to deal with emergency and other repair The contact and telephone number details should be applicable for contact between 9am – 5pm Monday to Friday, and should also include an out of hours contact number for use in emergencies. Any change in contact and/or telephone number details should be provided to occupiers within 24 hours of the changes being made. Copies of the written information provided to tenants must be provided within 7 days of the Council’s demand. 23. The licence holder shall indicate to the occupier(s) how they intend to respond to the complaint including a timescales for the steps they intend to take. 24. The licence holder shall respond to any complaint within a reasonable timescale. Copies of all correspondence relating to complaints shall be retained during the currency of the occupation and for 6 months thereafter and shall be provided to the Council within 7 days of the Council’s demand. a) A true copy of the licence to which these conditions apply. d) The information required by conditions 18, 22 and 26. 27. The licence holder shall comply with all relevant landlord and tenant law and shall ensure that all legal processes are followed when requiring occupiers to leave. If a complaint of illegal eviction is made to the Council the licence holder shall provide information as to the steps taken to evict an occupant within 7 days of the Council’s demand. 29. The licence holder shall ensure there is suitable and sufficient buildings insurance in place for the duration of this licence. This should cover the costs of re-housing occupiers in the event of a need arising. 30. Before a new tenancy is issued the licence holder / agent should carry out an inventory and document it with photographs (where appropriate). Both the licence holder and the tenant shall date and sign the inventory and each retain a copy. 31. Where a deposit is taken the licence holder must provide any tenant with the relevant information about the deposit scheme to which it relates and any other information required under section 213 of the Housing Act 2004. This information must be provided to the Council within 7 days of the Council’s demand. a) Any letters, relating to anti-social behaviour, sent or received by the licence holder, or agent of the licence holder, must be kept by the licence holde True copies of the original document should be provided to the Council within 7 days on demand. c) If a complaint is received, or anti-social behaviour is discovered, within 7 days the tenant must be informed of the allegations of the anti-social behaviour in writing and of the consequences of its continuation. d) From the date of receipt of the complaint of anti-social behaviour, monitor any allegations of anti-social behaviour and take all necessary steps to establish if it is continuing. e) Where the anti-social behaviour is continuing after 14 days from receipt of the complaint, the licence holder, or his agent must, within 7 days visit the premises and give to the tenant, or leave at the property marked for their attention, a warning letter advising them of the possibility of eviction. f) Where the licence holder or his agent has reason to believe that the anti- social behaviour involves criminal activity the licence holder must ensure that the appropriate authorities (e.g. Police, Council etc.) are informed. g) If after 14 days of giving a warning letter the tenant has failed adequately to address the anti-social behaviour so that it is continuing, the licence holder must take appropriate formal steps under the tenancy agreement, whether to enforce its terms or to terminate it, including, where necessary, by taking legal proceedings against the occupier(s). h) Where the obligation under (g) has arisen, the licence holder must, within 7 days, provide to the Council in writing a plan setting out the steps he proposes to take, and the timescale for taking those steps, in order to resolve the problem. c. Any changes to their, the manager’s or any associate’s circumstances which could affect their fit and proper person status, i.e. any cautions or convictions for any offence involving fraud, dishonesty, violence, drugs, sexual offences (under Sexual Offences Act, schedule 3) discrimination or breach of housing or landlord / tenant law. d. Any proposed changes to the layout of the house that would affect the licence or licence conditions. by completion of other suitable training on the law and legal requirements relating to managing privately rented properties subject to approval by the Council in advance and subject to submitting a pass certificate or similar document to the Council for confirmation. 35. Where reports, certificates, declarations or other documents are required to be produced or supplied to the Council, this shall mean sending by email (preferred method), post or delivering by hand, declaration to the Council’s offices for the attention of the Housing Licensing and Compliance team. Let us take the worry out of your Selective License Application. We inspect every property that we manage using the HHSRS 29 Hazards. The council intend to inspect 100% of all Selective Licence applications in Netherfield. There will be 650 properties liable to Selective Licence in the Private Rented Sector across Netherfield. Would your property pass an inspection by Gedling Borough Council? Many landlords will take the risk of not knowing but if you get a council inspection and they find issues it can be very costly to put them right because you will have to do it straight away.